Davy Kehoe - Short Passing Game. Vinyl EP. Bleep. 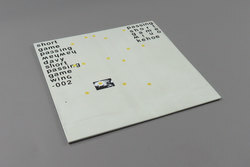 Proper out-there sonic mutations from deepest Ireland on this one. Davey Kehoe debuts on the Wah Wah Wino label with six tracks that sound equal parts Bruce Gilbert, Manuel Gottsching, Prince and Suicide. ‘Happy Highway’ sounds like a stoned summers day spent indoors binging on old krautrock tapes and pollen, sat with your mates trying to craft up your own interpretation of what those German’s did so well. ‘Storm Desmond’ may well be the anthem of the EP, a shimmering trip through the jungle evoked through the uniquely indulgent harmonica and clarinet pairing. EP closer ‘Running Into Coverage’ sounds like someone put a contact mic next to a running tap and exited the studio with their drum machine left on overnight, and we mean that in the best possible way.